ID Security Online provides a wide selection of ID software used to personalize and customize your badges. Most of our ID software includes card templates to choose for your badge design. This software also allows you to design a card from scratch using your own images, graphics, and logos as well. Moreover, our photo ID software makes it easy to add information to your ID cards. Most can even connect to a database so that all your card data is easily accessed. Even the most basic photo ID software can add a barcode to your ID badges. Barcodes are a cost-effective way to include data on your cards that can be scanned and used in other systems. 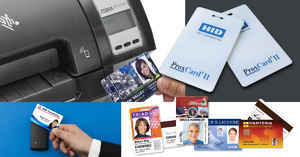 ID Security Online's photo ID system comes with everything you need to to create your own photo ID's for your badges. 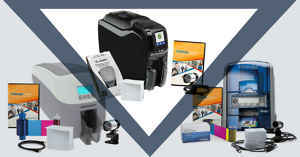 Our selection of digital photo ID cameras allows you save images so that they can be placed within your card template right from your software. These cameras provide sophisticated and simple imaging features and controls, tripod compatibility, and can be operated on a range of systems. Badge holders are designed to protect ID badges from tearing and fading. Simple and inexpensive, but unfortunately many organizations overlook the value of badge clips, lanyards and other holders. By making it easy for your staff and visitors to wear their badges at all times, they are far less likely to forget or misplace them. Lamination is the single most effective way to improve not only the security, but the durability of your ID cards. Any attempt to tamper with a laminated ID would result in the card being destroyed, as the layers would be irreparably torn apart. Plus, it provides an added obstacle for anyone trying to reproduce your badges. Printing some of your cardholder data on the back of your cards will give the front of your ID badge a professional look. 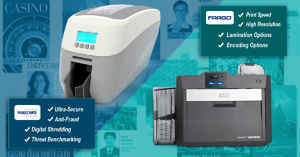 Dual sided printers save money and time by printing on both sides of your card in one process. 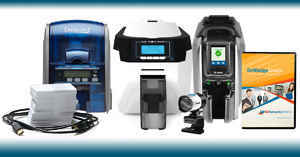 You can browse through our selection of duplex ID card printers. Ribbons are an essential part of printing great ID badges with your ID card printer. 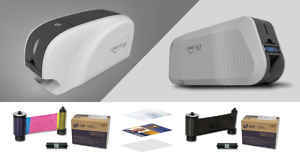 ID Security Online offers a variety of ribbons in color and monochrome for specific brands of ID card printers.